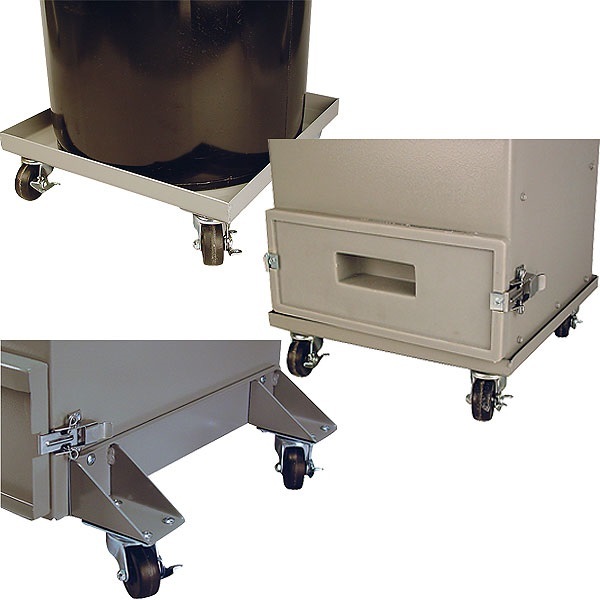 Wheel Kits are an easy way to make your vacuum or dust collector portable! A must if you already have a wheel kit on your cabinet. Feature heavy-duty swivel-locking casters to make unit mobile or hold it in place. 14 gauge all-welded steel construction for durability. Simply drill and bolt-on in minutes. Include instructions and mounting hardware. Made in USA. #6120-35 - Vacuum and 176-DC & 180-DC Wheel Kit - Fits Vac-50, and older Vac-45, 40, 36, 35, and 34 Skat Blast Vacuums; and 176 & 180-DC Dust Collectors. Tray-type design with 2" casters. #6120-36 - 201-DC, 301-DC & 310-DC Dust Collector Wheel Kit - Fits 201, 301 & 310-DC Dust Collectors. Includes left and right wheel assembly and hardware. 2-1/2" casters. Standard Wheel Kit with 2-1/2" diameter wheels. Raises cabinet 1". Fits 28" deep cabinets. I have been putting most of my equipment on wheels to aid in shop cleanup and keep the floor from rusting after power wash.I didn't like the hardware that came with the kit to bolt the plat to the bottom of the vacuum. I replaced the 1/4" bolt and lock nut with a 5/16" grade 5 bolt and spacer washers in between the canister and wheel plate . Awesome product!!! Makes it Easy to move around shop. This is a very good product for its use. I was going to fab a set of similar to these but just don't have the time. I like how they are designed to have the cabinet frame sit on an under ledge on the caster base. I wish they also designed a set to mount on the inside of the cabinet instead of the outside but still very useful and on a concrete floor the 960 I have Rolls very easy. Service & Delivery comments: Delivery was fast as usual. I think they sell great products that are more durable than most but shipping is pretty high compared to most companies and their product "sales" are not super great. It is also great that I can buy parts for my older blast cabinet and they since they do not change many things all the time. I love my 970 cabinet. The only thing I wish it had was a door on the opposite side. The wheel kit takes care of that. I would have preferred the wheels of have been mounted inside the cabinet too keep them out of the way. I may actually do that modification myself.